Hare Krishna! Already that day in a row there is no sound. Image has seen and which tracks are played. but there is no sound at all. So it should be? 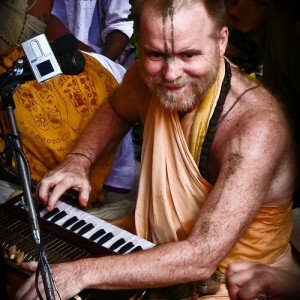 The audio stream has been up since January 6, which can be checked on the Icecast status page http://icecast.24hourkirtan.fm:8000/. If you don’t hear anything it’s very likely that there was a problem with your player, so depending on how you’re listening, you might need to double-check if you have to upgrade your browser or radio client. I heard from another listener that there were problems with Internet Explorer and Silverlight. Upgrading the Silverlight fixed the problem for him. Thanks, thanks a lot, wonderful seva, may Radhe Syama bless you all!! !